In September, C&F H.O.G. went on a long weekend jaunt to Reims, in France. The night before we left, we stayed just five minutes from the Channel Tunnel rail terminal in Folkestone. However, this closeness didn’t mean all of our group would make it onto the train. One South African scallywag, who will remain nameless, had a problem with the visa in his passport and knowing the immigration people didn’t always check passports on the way to France, he decided to chance it and see if he could travel anyway. He didn't make it as the eagle-eyed immigration officer spotted the error. Gavin (oops) is now going to make sure he gets his visa up-to-date. The trip was organised by C&F Safety Officer Nick Deal. I never knew that Nick was quite so organised. In the weeks before he led the C&F ride to Reims in France, he produced a briefing note, a short lesson on French road signs (I have ridden in France a lot and I did learn something) and gave us options where we could go while on the four day trip. It was impressive stuff, so hats off to Nick. The ride down to Reims was in two parts - a blast on the French motorway system through less interesting parts of northern France, followed by great back roads in the afternoon. Under blazing hot skies, we cruised along twisting roads through farmland and seemingly deserted small villages. It never ceases to amaze me when riding through rural France where the people go. Just occasionally we glimpsed a person tending their garden or working on their house, but for the rest of the time, nobody could be seen. Where do they all go? 188 miles later on day 1, we arrived at our base for the weekend, in the city of Reims, which is important in French history as it was the traditional site where the kings of France were crowned. 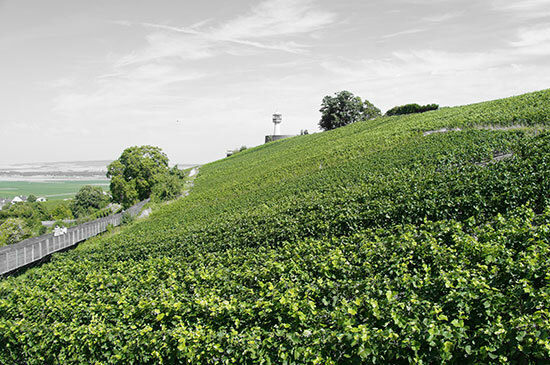 More importantly to us however, is its location at the very heart of the Champagne region. It was a Thursday night and the place was buzzing. Street cafes, bars and restaurants were full with people. It was a good job that Nick had made a reservation at his favourite restaurant, the Grand Café, for our group. Nick & Jane go to Reims often, as evidenced by the warm greeting they received from the waiter (hugs all round). By now, Janet (the partner of the errant passport owner) had arrived having left Gavin to sort out the mess with his missing visa. It would have been wrong to ignore the regions local products, so we tucked into a few bottles of Bollinger champagne as we ate a good meal on the warm September evening. A lot of the track, the pits and main grandstand survive today and that was where we chose to park our motorcycles. Les from Warr’s parts department, along with Ken and DOF (David O’Flaherty) decided to use the track for the purpose it was built and went for a blast along the main straight. They roared past at just over the speed limit (!) 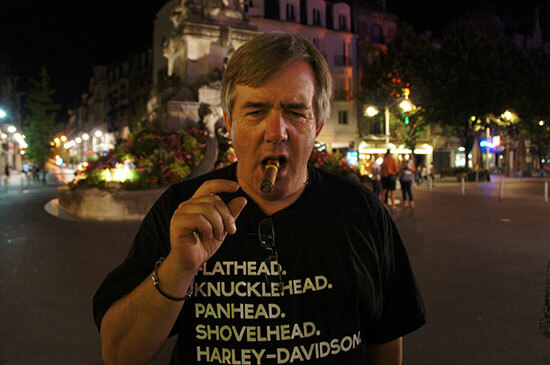 and flashed past the pits just as Geoff Duke would have done in 1955 when he won the 1955 French motorcycle Grand Prix. On their return run, they came past us a little more sedately and it made for a great picture. We then rode along some fantastic twisting and fast roads through some glorious French countryside. We passed a few immaculately kept war cemeteries with their neat rows of headstones. These bring powerful feelings, as the sadness of all of these men that died is a very strong emotion in me. I am also very proud of those men. They fought and died for our freedom from an evil tyrant, and for that I am forever grateful. I like to say a silent thank you to the men that lay in those cemeteries every time I pass one. Many of us have stopped and walked around the graves of different allies nations. British, French, American and Canadian World War I and II cemeteries are often visited. On this day when we were out riding through the French countryside, we stopped at a German cemetery, a first for many of us. This was the Fort-de-Malmaison cemetery which contains the graves of 11,841 German soldiers who fell between 1940 and 1944 in France. Many of them were killed during the liberation offensive of the Allied forces in 1944. With their simple black crosses, the graveyard was a sobering sight. 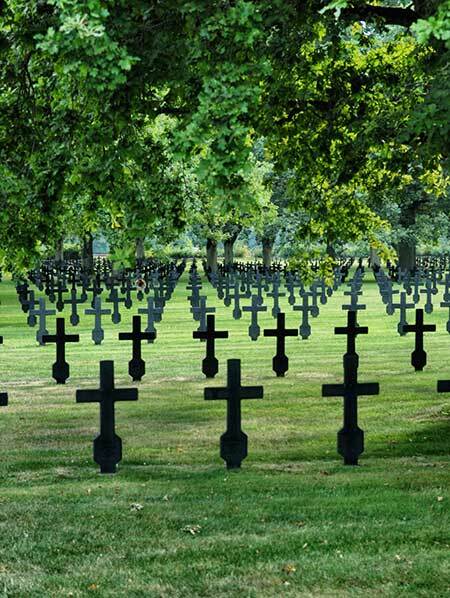 We learned that just under a million German soldiers are buried in France. After the rest of the group finally got out of bed, we reformed and went riding again. We went to see the monastery in Hautvillers where Benedictine monk Dom Pérignon lived. He did much to improve the process of making quality champagne and of course, one of the most famous champagnes is named after him. Across the road from the monastery, we went to taste the champagne and at 10.30am, the one glass we each had really hit the spot. In the afternoon, we left our motorcycles at the hotel and went to see another great champagne producer, Taittinger, or more precisely, one of their cellars where they keep their wine during the manufacturing process. During the French Revolution, the Abbey that used to stand on this site was destroyed, but the caves underneath, once a chalk quarry, are now used to store 3 million bottles of Taittinger champagne. This is the smaller of the storage cellars and the other holds an incredible 16 million bottles! Each bottle stays in the cellars for between three and seven years while the fermentation process happens. The tour of the cellars took about an hour and covered all aspects of making the champagne. Of course, we had to try some. Congratulations must go to Nick & Jane for organising such a terrific long weekend away. They made everything work so well and all the rest of us really had to do was turn up and do what they said. Many thanks also to Les, for being Last Man the whole way. A great foreign ride all round! For this story we have to rewind to 2008, the year of my second visit to London and Warr’s Harley Davidson. As an eight year H.O.G. member myself, I noticed Warr’s sponsored a H.O.G. group, Chelsea & Fulham. During the intervening years after ’08 I would on occasion visit Chelsea & Fulham H.O.G.’s website. While on their website I would read about their rides as these were available for all to see, being as they are an ‘open’ chapter. From my visits to C&F’s website the idea gradually grew, on how great it would be to experience a ride on the other side of the ocean with fellow H.O.G. members that were of a different country and culture than mine. Recently retired from my work as an architect in the state of Illinois, I followed this with a move to Denver, Colorado. Denver is where my two boys lived with their families, but also it has the Rocky Mountains where I enjoy riding my Harley Davidson Fatboy. This move meant I had to acquire a new H.O.G. family and with four H.O.G. groups in the immediate Denver metro area, I chose the that sponsored by Sun Harley Davidson of Thornton, Colorado. My new H.O.G. family was Colorado Chapter Thornton or CCT as we call it. At one of my very first CCT H.O.G. meetings our director opened the meeting by asking the question “What would your dream ride be?” My first reaction was I didn’t have one. However, I sat and contemplated the question then the C&F website came to mind and gradually became my answer. I now realized I had not only come up with an answer to my director’s question, but I had what I truly considered to be my ‘Dream Ride’. The following day I went to the C&F website and reviewed their 2013 ride schedule. I was looking for overnight rides. I soon chose the C&F September destination - Champagne Ride to Reims in France with day rides through the Champagne wine country. It was with excitement and trepidation that I e-mailed my ride request to Warr’s HD. I stated how I had been a H.O.G. member for 12 years, listing the various officer positions I had held and finished with that question asked by my chapter director. It was easy to write my request but it was harder to press the “send” button - what if they said, “yes”? It did not take long to hear back from John Warr himself who quickly passed my request on to the Champagne Ride’s Safety Officer, Nick Deal. Nick admitted some surprise to my request and needed some additional information from me, but after few more e-mail exchanges, I received a ‘welcome aboard’. Nick sent me everything I needed to make the appropriate reservations for the Champagne Ride. The next few days flew by in a whirlwind of e-mail reservations for airline tickets, hotel rooms, a ‘Le Tunnel’ ticket and my hire bike a 2013 black Heritage Softail from Warr’s. Nick also included me on Facebook page that many C&F members used - the rest of the summer passed with hundreds of e-mail exchanges. Now that you know how this came about we can fast forward to 4th September and Folkestone in the United Kingdom. Folkestone is where the C&F ride officially began. It sits on the English coast and is the departure point for the undersea train connecting the UK to the continent. Our group informally came together arriving at different times throughout the early evening at the local Holiday Inn. This allowed me to meet my fellow riders more individually. We had drinks outside in a late afternoon sun and by the time we moved inside for dinner I had already been made to feel welcome. After dinner the group drifted away to bed, I was last to retire along with C&F Road Captains Oliver Achkar and Les Channing. Our first morning the weather was sunny and warm as predicted and the group slowly gathered for breakfast that morning. Soon we were ready and pulled out of the hotel for our early crossing. Loading onto the train is a large but efficient operation, we approached the loading carriage in single file and soon we ready to get under way. It’s 35 minute journey under the English Channel, and was a first time experience for this American traveller. Soon enough we were on French soil in Calais. This story is about a group experience but the riding was individually exhilarating as we pulled out Calais onto the A-26 autoroute. As inspiring as the English countryside was yesterday, today I was riding in France under a French sun, through French countryside. I regularly had to remind myself, where I was because so many things were familiar to me. 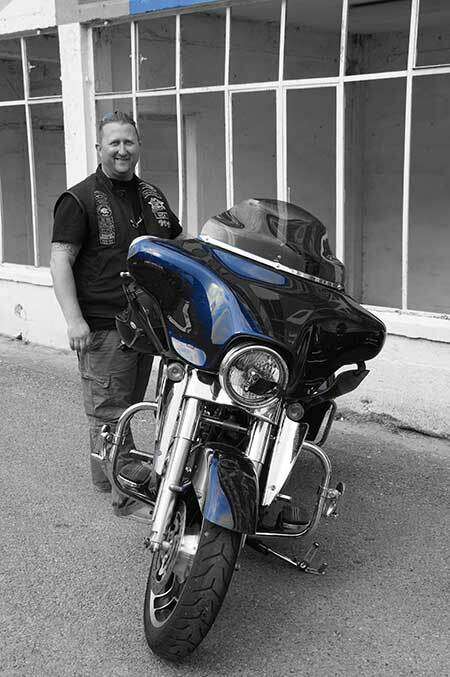 The autoroute had an American feel to it, the Harley Davidson I was riding felt as if it was my own and I was used to riding with fellow H.O.G. members. That said, there was no mistaking the road signs and countryside I was rolling through as French. This was the H.O.G. experience I was hoping for! After a hour or more of riding we left the A-26 in Cambrai, my experience intensified as we were now on more narrow roadways that rolled and turned with the landscape. As we went through the towns you could see the people and imagine their lives. It was early afternoon when we rolled into the picturesque town of Bohain-en-Vemandois, which was the town chosen for our lunch stop. We pulled into a large stone paved plaza with one side lined with the quintessential outdoor cafes. Soon our Harley Davidson’s were parked on one side of the plaza and we were seated nearby ordering our meals. After lunch we took advantage of the beautiful setting and took a group photograph of us standing next to our hogs. The afternoons riding continued, threading through the countryside until Reims gradually made itself known to us. Reims is an ancient city initially inhabited by the Remi tribe of the Gauls. Today, it is the administration and commercial centre for the Champagne wine region. The Best Western De La Paix on Rue Buirette was where our group stayed each night as we toured the Champagne country during the day. The hotel was located just steps away from the Place d’ Erlon and the Fountain Sube. Fountain Sube is topped with a gold statue of Winged Victory and represents the four rivers flowing through champagne country the Vesle, Suippe, Aisne and Marne. While Place d’ Erlon represents the heart of the city’s vibrant social life and cityscape. 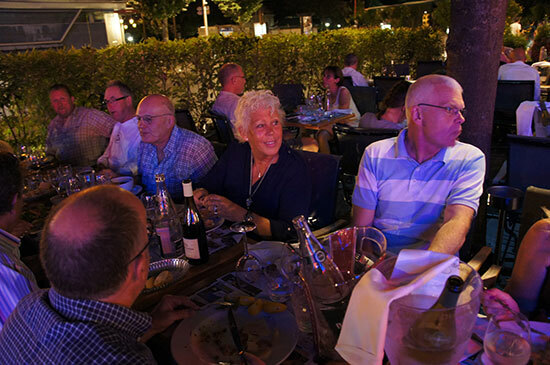 After a perfect day of riding Chelsea & Fulham was ready for delightful evening dining outside at the Le Grand Cafe. 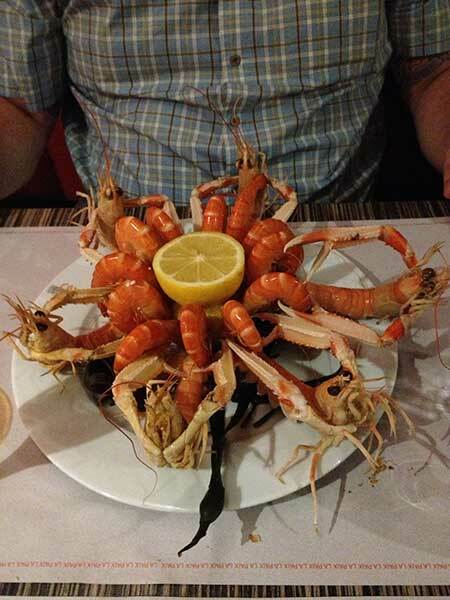 This restaurant specialises in mussels or le moules when ordering off a French menu. Many of our group indulged in the mussels and a few opened with a first course of the classic French dish Escargot. And of course what is a meal in Champagne country without Champagne? This was a three hour adventure in dining French style. On our first morning in Reims the French sun shone magnificently, unfortunately Oliver and Jo Achkar had left earlier that morning for Lyon and a wedding. 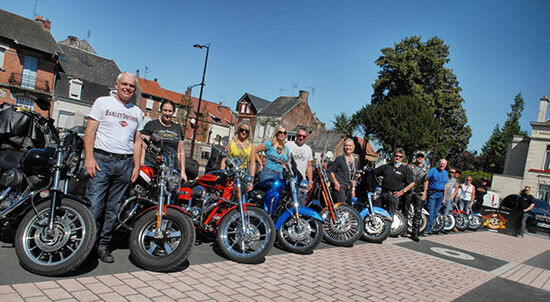 Our C&F ride out that morning made the new Reims Harley Davidson dealership its first official stop of the day. It was a clean and modern building, bold in colour with black and orange. Once inside we also got a look at Harley Davidson’s new 2014 models followed with t-shirt and souvenir purchases. 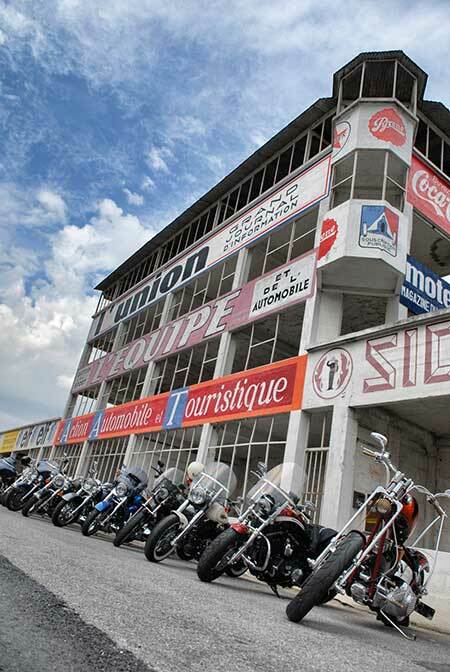 Soon it was on to the former Formula One racetrack, the Circuit Reims-Gueux. 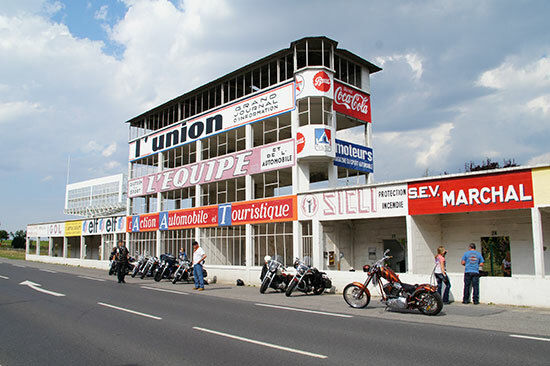 Unused since 1972, the Circuit Reims-Gueux once hosted 14 French Grand Prix races. The track’s final straight away is now part of French Route D27. The faded concrete grandstand and pit areas soon rise to view, knowing a photo opportunity when we saw it, we stopped and lined our bikes up along the old pit area. First used in 1926, the tracks fading advertisements echoed its former glory. C&F’ers Ken, DoF and Les made a pass on their bikes perhaps riding in fitting glory for photographs. 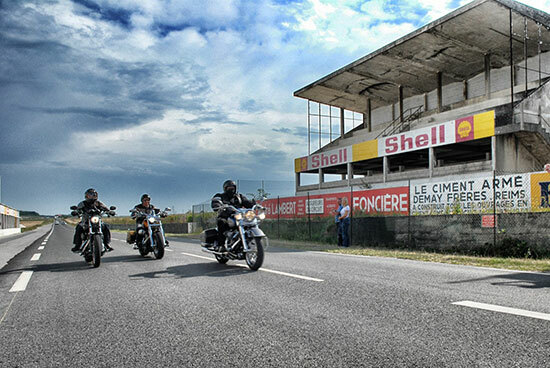 Leaving the remnants of France’s racing past behind we rode out to visit the heart of the Champagne wine region. As grapes hung on the vines and the sugar thickened, we travelled over narrow roads and threaded through small villages we rode through and enjoyed the scenery. After making our way through the village of Verzenay we pulled into small parking area. Once our hogs fell silent we dismounted and followed a narrow footpath through the grapevines. Around a bend in the footpath the La Phare or lighthouse came into view. The lighthouse seemed quite out of place as it stood 25 metres above the landscape, until you realised it stood over an ocean of Champagne grapevines. La Phare also, is home for a museum of the Champagne history. La Phare is a must stop for lovers of Champagne. From La Phare we retraced our route through Verzenay and made our way to Epernay-Dizy for lunch at the Hotel Campanile where fellow rider and custom chop rider Gary France seemed to thoroughly enjoy a Salmon crumb casserole. After lunch our afternoon started out with a photo opportunity at the Moet & Chandon estate, a classic Champagne country scene. This was followed by a glimpse of the Abbey Saint-Pierre in Hautvilliers, which we would visit the following day. Mid afternoon we took a break for beverages at a biker bar in Fismes. We relaxed outside in the warm sunshine across from the picturesque Hotel de Ville. Refreshed we made a dash for a World War II German cemetery where nearly 12,000 German soldiers lay at rest under dark metal crosses. It was sombre reminder that this idyllic setting had been a battleground more than once. Back in Reims the evening was going to be centred around the light show presentation at the cathedral Notre-Dame de Reims, but rain stopped our visit to the light show presentation. Instead our group borrowed umbrellas from the hotel’s front desk and merrily made our way to the restaurant Casa Mia for pizza and pasta. Dinner tonight just took two hours, lighter than the previous evening! Umbrellas were returned to the hotel and the evening was finished in the bar where a few of us enjoyed Ken and Priscilla’s favourite dice game. Our third and final ride out was once again in bright sunshine after the previous evening’s rain. Leaving as scheduled we first stopped and refuelled, as was becoming our routine then we were once again rolling south through the vineyards of Champagne country. We passed familiar landscapes as we rumbled to Hautvilliers. A trip highlight was ahead of us as we parked along the street near the Abbey Saint Pierre. From the abbey it was a short stroll down the street to the Champagne house, JM Gobillard et Fils. Nick had arranged a champagne degustation (tasting) for us, and soon we were holding glasses of bubbles - cheers! What a great day and it wasn’t even noon yet! After our toasts a few of us made our way back to the historic abbey. Abbey Saint Pierre is where the monk Dom Perignon was serving when he was said to have invented Champagne. And it is within the abbey’s walls that Dom Perignon lies today. While in the abbey a light rain threatened, so we suited up and rode another hour before ending up back in Reims. Lunch was at the Les 3 Brasseurs a casual fun atmosphere where they make their own beer. Several of us tried the sample plate with four different beers and David Hogg and I took pictures of each other holding up our plates of beers. After lunch it was short break until we assembled again for a short taxi ride to caves of Tattinger. Our visit included a tour of their chalk caves that were first dug by the Romans in the 4th century AD as chalk quarries. The Abbey Saint-Nicaise was built over the old Roman quarries and they became the abbey’s wine cellar. The abbey was unfortunately destroyed during the French Revolution although the wine cellars continue in use to this day. The cellars are humid and cool and perfect for allowing Champagne to mature as our tasting later was to prove. Once inside the Tattinger tasting room Chelsea & Fulham H.O.G. was lifting Champagne glasses for the second time that day. 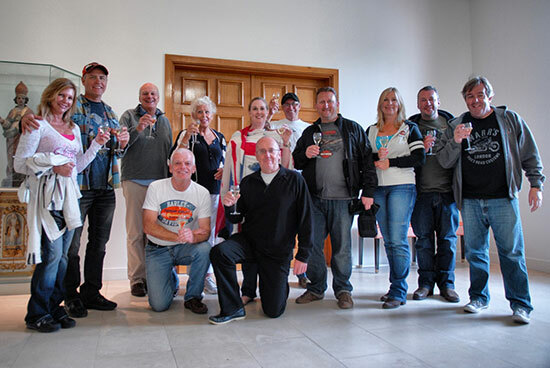 Our visit was finished with a group photo outside against a wall with the Tattinger emblazoned on it. The finishing touch of our three day visit to Champagne region was a visit to Reims famous Gothic cathedral. Construction on Notre Dame de Reims started in 1211 and was where the kings of France were crowned. Most notably King Charles I was coronated here because of Joan of Arc’s victories for his cause. The three portals on the cathedrals front facade are adorned with statuary along with a statue of Joan of Arc mounted and sword raised in the foreground. Notre-Dame Reims was our groups last tourist stop and was followed by our last dinner together. This was a three hour affair at the Cafe De La Paix located on the Place de’ Erlon. Once again our ride leader Nick had made reservations for our H.O.G. group and our table places were reserved and waiting for us when we arrived. Knowing this was our last evening, C&F members were in the mood to celebrate and we shared a convivial meal together. Fine food was ordered and consumed with thanks made for our trip leader who then handed out special badges to commemorate the trip. As you would expect for a Champagne ride, multiple bottles of champagne were consumed and toasts made. Our last morning arrived again with sunshine as our group gathered on the sidewalk with our bikes outside the hotel. The talk was of possible rain before reaching Calais. Although the possibility of rain did not deter us from a final great ride and we took the D6 a twisty road heading from Soissons in a northerly direction. A quick coffee break was taken in Blerancourt, where Susie Jones and I bought pastries in the local patisserie. The twisties continued past Blerancourt until we rolled into Roye for our lunch break and finding the perfect French brassiere for our last meal. A timber and stucco exterior with a very French owner who was very happy to see us on a slow day. The majority of us had the special of the day, which was Brochettes de Boeuf. As we sat and finished our meal you could see the clouds gathering to the north. It seems that after Roye the roads got a little straighter and busier until we were back at the Le Tunnel port in Calais. We had to negotiate some long weekend lines and customs before boarding our train. Once underway a final group photos were taken, handshakes and hugs given. Upon landing in the United Kingdom the Champagne Ride was over and C&F members scattered on the motorway hoping to avoid the oncoming rain. Harley Davidson and H.O.G. made my dream ride possible. But it was Nick as road captain who went above and beyond to make my dream happen. As I toasted C&F members on our final evening, "I came over for the ride, but I enjoyed the people more" cheers!